Enticing, center door knobs build cohesiveness in a row house, townhouse, or single-home community that prides itself on historical appeal. Add a fiberglass sidelite and you increase the visual width of your historical-themed fiberglass door. At first glance, your visitors will think you have a classic, six-panel French door. The center knob and modern plate and key reproduction parts enhance the look while providing contemporary security and smooth operation. 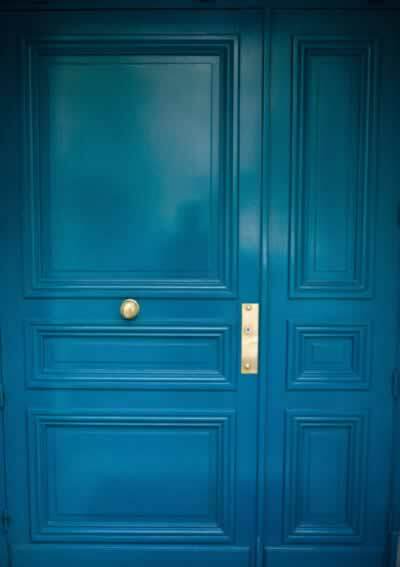 Fiberglass doors come in a breathtaking range of colors and styles to match the design of your home. Not only is this door set beautiful to behold, it comes with energy-efficient attributes that surpass wooden doors. And maintenance is a snap with mild soap and water. You can put away your paint brush, scraper, and ladder.